As you can see Britannia is swathed with the Union Jack. An expensive repainting job may have been necessary. His problem was of course insignificant compared with Irishman Willie Walsh. England Airways does not ring right and he has getting on for 300 aircraft showing what is known as the Chatham (Dockyard Union) Flag on the tailfin. No other annual guide charts the growth of the modern cruise industry the way Douglas Ward’s authoritative annual Berlitz Cruising & Cruise Ships has done, now in its 30th anniversary year. The 2015 edition of this enduring cruising bible is out. If you are thinking of a cruise, or perhaps not cruised before, there is a 196 page glossy introduction followed by 500 pages covering 270 ships. in some ways repetitive, all the Princess Cruises Grand series for instance are pretty similar, the book does explain the types of cruises, details the major operators, and has sections on even minor interest subjects such as sail cruise ships and cargo ship cruising. Since the beginning, the book has been helping consumers to pick the right cruise for the right price and with the right expectations, but the many editions also chart the development of modern day cruising, from its start in around 1970 to the industry juggernaut that it is today. More than 22.8m passengers worldwide and 1.79m from the UK will take a cruise this year. When it comes to awarding prizes cruising, just like any other form of leisure travel, is purely subjective. Hapag Lloyd again tops the Berlitz rating chart but Europa 2 and Europa are small ships 42,000 tons (500 passengers) and 28,000 tons (400 passengers) respectively and whilst offering English on board are very much aimed at the German/mid European market. Throughout the three decades, the cruise industry has maintained a global growth of over 7% each year making it the biggest success story in the travel world. Year-on-year, ships have become more sumptuous, developing into self-contained resorts and the choices and standards have all improved dramatically. Now there is a vast range of destinations and accommodation options, more lavish entertainment, a burgeoning number of theme cruises, a greater selection of restaurants and bars, top-end sports and fitness facilities, high-tech onboard digital communications and, of course, stringent safety regulations. The Costa Concordia disaster has reminded operators of how important safety is. Recently brought to the attention of Business Travel News was an incident with P&O where fly-cruise passengers were delayed due to a road accident. When the travellers were finally delivered to the ship, tired and hungry (no food on the coach) there was a further wait as they undertook the safety drill. No compromise. The ship would not leave the port until the regulatory undertaking had been completed. Five best ships for families – Chosen for family-friendly facilities, activities and entertainment: Allure of the Seas/Oasis of the Seas; Disney Dream/Disney Fantasy; Mein Schiff 3, MSC Preziosa, Norwegian Breakaway/Norwegian Getaway. To which BTN can concur on the Norwegian ships and the Editor has added P&O Ventura with its top grade children’s area. Five best cruise lines for teenagers – Teenagers like space away from adults to hang out and meet others. Some ships get it, others don’t. These do: Disney Cruise Line (Disney Dream, Disney Fantasy); Norwegian Cruise Line (Norwegian Breakaway, Norwegian Epic, Norwegian Getaway); Princess Cruises (Royal Princess, Regal Princess); Royal Caribbean International (Quantum of the Seas), TUI Cruises (Mein Schiff 3). Five best water slides – Children can’t wait to go for a ride once they are on board: DrainPipe (Carnival Cruise Lines); Aquaduck (Disney Cruise Line); Vertigo (MSC Cruises); Epic Plunge (Norwegian Cruise Line); Parthenon Slide (Star Cruises). Norwegian is pretty good as well. Five most luxurious suites – We will not detail here as John Ward does like the good things in life and it is only a very small minority who are affected, suffice to say that he liked the Royal Loft on Allure of the Seas, Oasis of the Seas (Royal Caribbean International, the Crystal Penthouse on Crystal Serenity (Crystal Cruises) and the Owner’s Suite on Europa 2 (Hapag-Lloyd Cruises). The Sandringham Suite on Queen Mary 2 (Cunard Line – An Art Deco apartment on two levels with a sweeping curved stairway, and an oversized balcony deck) came in for praise and BTN did stay for one night in simply splendid Wellington Suite on Saga Sapphire. A very large lounge, huge bedroom and monstrous bathroom including a Jacuzzi. Five best cruise ship spas – Wellness and pampering on board have become major attractions: AIDA Cruises (AIDAprima); Cunard Line (Queen Mary 2); Hapag-Lloyd Cruises (Europa 2); MSC Cruises (MSC Fantasia, MSC Preziosa, MSC Splendida); P&O Australia (Pacific Pearl). Five best ships for child-free cruising – One from each of five different cruise lines: Adonia (P&O Cruises); Grande Mariner (Blount Small Ship Adventures); Island Sky (Noble Caledonia); Minerva (Swan Hellenic Cruises); Saga Sapphire (SAGA Cruises). Five best cruise lines for foodies – chosen for the quality and variety of ingredients, their creativity and presentation: Crystal Cruises; Hapag-Lloyd Cruises; Oceania Cruises; SeaDream Yacht Club; Silversea Cruises. Five longest swimming pools – Most cruise ship pools are small considering the size of the large resort ships today, but that is because water can slosh around when the weather is bad. Here are the longest: Mein Schiff 3 (25 meters); Europa (17.3 meters); Europa 2 (14.meters); Asuka II (13.5 meters); Crystal Serenity/Crystal Symphony (13.5 meters). 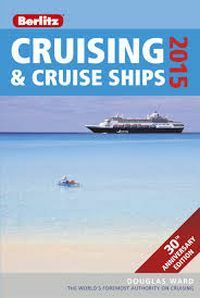 Berlitz Cruising & Cruise Ships 2015 (£18.99). Back in March P&O introduced Britannia, its latest sea going travelling resort, to the travel trade at the appropriately called Fish Island just by the Stratford Olympic Stadium. Formans smoked salmon emporium has been around since 1905, not as long as P&O’s 170 years, but not a bad stint. The 2015 brochure had still to be published. With this massive 250 page production now available it seems a good time to detail preview some aspects of a ship which can accommodate up to 3,647 passengers (and over 4,000 with children in the summer months). Britannia adds 25% more capacity to the cruise line. If you are thinking of booking on Britannia’s maiden voyage forget it. The ‘sold out’ sign has been posted. The new flagship of P&O sails out of Southampton on 14 March 2015, a 14-night trip visiting Gibraltar – Barcelona – Monte Carlo – Civitavecchia – Ajaccio – Cartagena – Cadiz and Southampton. 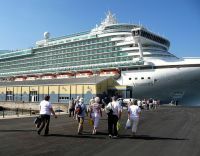 Her programme for the summer is a mixture of mostly 7 and 14 day cruises from Southampton, before an Atlantic crossing on 23 October, completing the cruise at Barbados, her home for the English winter. With Britannia it does look like P&O are on to a winner, a remarkable holiday experience, the culmination of the line’s focus on the cruise industry since the introduction of still very popular and now ‘adults only’ Oriana in 1995. 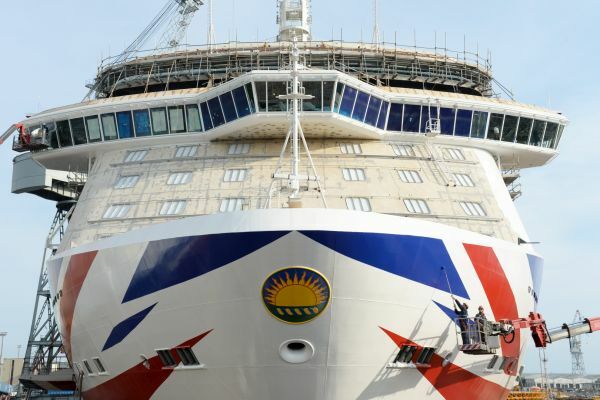 The ship will be P&O Cruises greenest yet and has been designed to deliver a much greater level of operational and environmental efficiency. A new hull form reduces unit fuel consumption by up to 20%. Over the coming months we will preview some aspects of Britannia. If P & O sister company Princess latest arrivals Royal Princess and Regal Princess are anything to go by the interior will be stunning. Formans was an ideal place for P&O to introduce The Cookery Club, a major feature of the ship. Run in consultation with James Martin and featuring the other P&O Cruises Food Heroes Marco Pierre White; Atul Kochhar; master patissier Eric Lanlard and cheese expert Charlie Turnbull, The Cookery Club will have 24 state of the art stations for participants. When the celebrity chefs and experts are on board they will be taking master classes and hosting interactive presentations over lunch and dinner at the chef’s table. TV wine expert Olly Smith will feature in The Glass House bar and grill. P&O sets very high standards when it comes to looking after children but please be aware that if they are under 13 (the company sticks rigidly to the date of birth) they have to be checked in and out, which means up to six visits to the stern area. It is a big ship. Hopefully by the time Britannia arrives this would have been computerised saving time and effort.